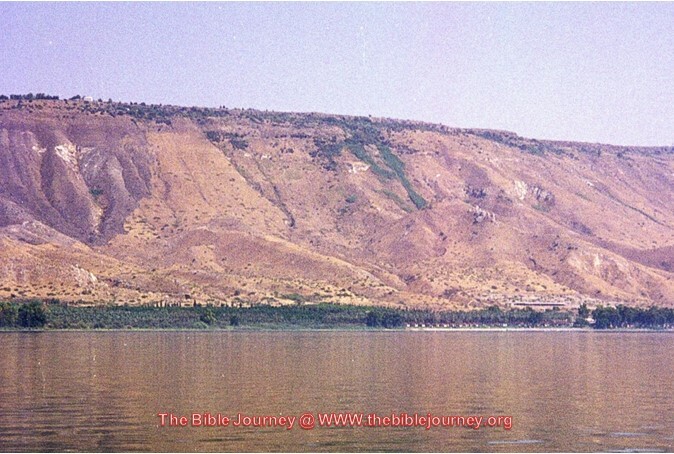 No one can be certain, but certainly an isolated shore, with mountains rising behind it, at least 4 miles from Capernaum. Where did they leave from? He knew he would feed the ‘five thousand’. He needed time to be by himself. He would then ‘Walk on Water’. Jesus had just heard that John had been beheaded and he needed to get away (Matthew 14:9-13). The twelve apostles had just returned from their missionary training, and needed rest. Let’s read Mark 6:7 and then 30-33. ‘7 Calling the Twelve to him, he began to send them out two by two and gave them authority over impure spirits. . . .
Jesus, together with the twelve tired apostles had set out for some lakeside rest. I can imagine that the apostles were excited by what they had experienced and needed to tell Jesus all about it. But they were soon to learn that others had needs too, and Jesus never turned away from helping the truly needy. signs he had performed by healing those who were ill. I get a feeling that the people were desperate enough to do this. Jesus was unlike any other Rabbi or teacher of the Law. He spoke with authority, backed up with miracles, and they were powerfully attracted to him. Eastern shore of Galilee today, looking south. But Jesus was not going to go to it this year (the year before his Crucifixion, see John 7:1). Hundreds of thousands would go, with large numbers travelling south towards Jerusalem on the road which went round the eastern shore of the lake. These would also have swelled the crowd. All males in Israel were expected to take part in the feast, eating the ‘Passover Lamb’ and remembering again the shed blood on the doorposts of the house which gave life to all those within. Is John reminding his readers in preparation for John 6:35 ‘I am the bread of life’? 5 When Jesus looked up and saw a great crowd coming towards him, he said to Philip, ‘Where shall we buy bread for these people to eat?’ 6 He asked this only to test him, for he already had in mind what he was going to do. Looking at the other gospel narratives, we read that Jesus ‘healed their sick’, and ‘spoke to them about the Kingdom of God’ and it was not until late afternoon that Jesus asked Philip his question. But here John hurries on to the miracle itself – possibly to set the scene for the teaching which will take up so much of this chapter. We are not told. Possibly as he came from Bethsaida he would know the area well, but others also came from there (John 1:44). Maybe then, Jesus wanted to test him (and the other disciples) to see how much they had learnt of Jesus’ ability to supply their needs. Andrew (also from Bethsaida) may have remembered the wedding at Cana but he himself doubted that such a small amount could be multiplied that much. Jesus of course, already knew what he would do (v6). Barley was used to make feed for horses and camels, but the poorer people also used it to make small loaves, or rolls. Again a contrast to the bread that Jesus would speak of later (from v25). 10 Jesus said, ‘Make the people sit down.’ There was plenty of grass in that place, and they sat down (about five thousand men were there). Presumably there may well have been women and children too, but we are not told. We are not told how this was done, but specifically we are told ‘as much as they wanted’. Does this suggest how we may have Jesus in our lives? He will not force himself on us, but he is unlimited in what he offers. 12 When they had all had enough to eat, he said to his disciples, ‘Gather the pieces that are left over. Let nothing be wasted.’ 13 So they gathered them and filled twelve baskets with the pieces of the five barley loaves left over by those who had eaten. This was not so much tidying the crumbs, as gathering the pieces that were left over from the distribution. Again, John did not elaborate on how this was done, but it was important to repeat that there was more than enough for everyone. What do you make of the phrase ‘let nothing be wasted’? God’s gifts are given for us to use wisely, we must not treat them casually, or wastefully. 14 After the people saw the sign Jesus performed, they began to say, ‘Surely this is the Prophet who is to come into the world.’ 15 Jesus, knowing that they intended to come and make him king by force, withdrew again to a mountain by himself. The people recognised that Jesus was special, perhaps ‘The Prophet’ that they had been taught to anticipate. But overriding this was the fact that here was a miracle-worker who could heal the sick, and create unlimited wine, bread and fish. For this reason alone he would make a marvellous king! Jesus slipped away, but many of those in the crowd settled in to wait for him to return, even being prepared to stay there that night. The Disciples waited too, but by evening they decided it would be wisest to return home before it became too dark. 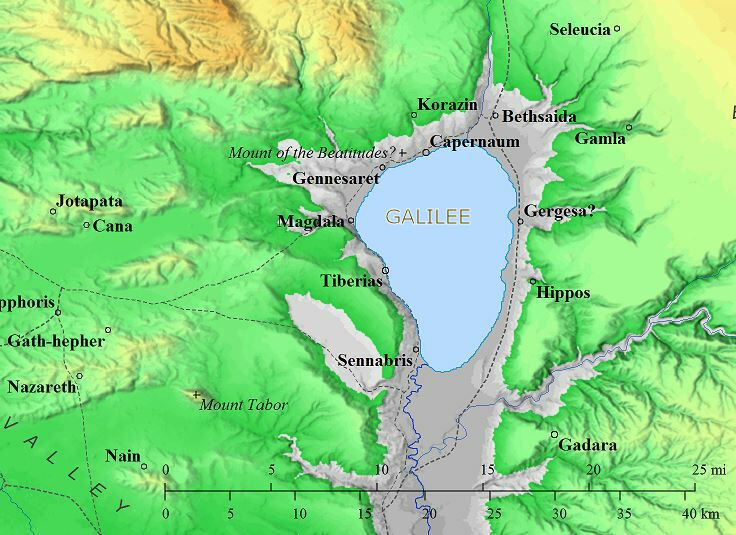 To reach Capernaum they would have to row parallel with the shore, but keep out far enough to avoid the breakers, and possible hidden rocks. There was also the danger that they could be carried out into the centre of the lake. But it had taken them a long time. According to Mark it was by then in the early hours of the morning (Mark 6:48). They had covered a fair distance before . . .
‘they saw Jesus approaching the boat, walking on the water; and they were frightened’. As they rowed they would be facing the stern of the boat and would gradually be aware of someone walking towards them in the darkness. To say they were frightened is putting it mildly. Matthew says ‘they were terrified. ‘It’s a ghost,’ they said, and cried out in fear’ (14:26). People living in darkness are often afraid when Jesus approaches them. Jesus had gone higher, and had spent many hours in communion with God – which could sound cold, stiff and formal – but the reality was a long time spent in warm intimate conversation with his own Father. And disciples were supposed to copy their Rabbi in everything. Many of the crowd were prepared to wait all night if necessary (v22). But after Jesus had left them, the disciples went downhill (v16)! And then set off without him. and immediately the boat reached the shore where they were heading. What a difference it makes when we have Jesus securely ‘on-board’ with us. The question remains though, why did Jesus do this miracle? (He didn’t need a lift – he’d walked practically the whole distance). This was as much a parable as a miracle. The disciples were acting out the way Christ’s followers would struggle, in the dark, seemingly getting nowhere, whenever they would try to work without Christ’s presence and power. They had set out without him, and presumably soon strained to watch the shore to see if he might join them. When these same Apostles began to build the Christian church, it would be an invaluable lesson that when Jesus decided that a night of prayer was what was needed, it would be foolish instead to set out into the darkness without him. But, having got themselves into difficult and dangerous circumstances, Jesus would always be prepared to come in a miraculous way to be with them.